Building on the recent success of data-driven methods in visual recognition as well as image and video restoration/enhancement, in this work we match test videos with a large database of crowd patterns and transfer corresponding pre-learned motion priors to improve online crowd tracking in test videos. There are several compelling reasons to search for simiar behaviors amongst crowd motion patterns. First, the motion of individuals in a high density crowd is often limited both by the physical constraints as well as social conven- tions of crowd dynamics. Both factors put strong limitations on the possible motions of individuals within a crowd. One can therefore consider the possibility of spanning the space of semantically distinguishable crowd patterns by sampling patches from a large database of crowd motion. Another compelling reason for searching motion priors amongst a large collection of videos resides in the fact that some motion patterns, such as an individual walking against the flow of traffic, may be observed in only a small num- ber of scenarios. Leveraging motion priors from a large database is therefore expected to provide a better model for analyzing both typical and rare crowd motions. This will take all the archive parts and combine them into one file and then extract this to the working directory. The tracking evaluation scripts will be made avilable shortly. 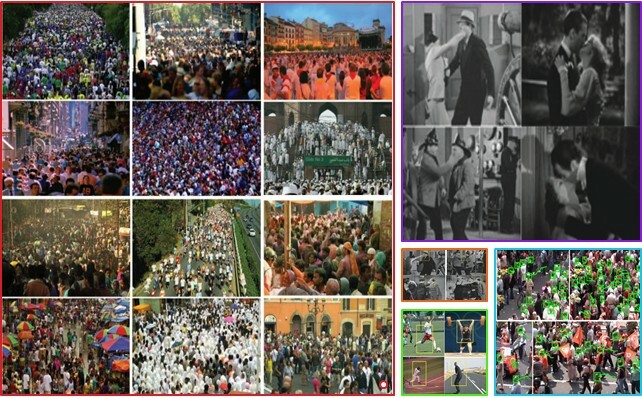 title = "Data-driven Crowd Analysis in Videos"
This dataset contains close to 200 video sequences at a resolution of 720x480. The collection represents a natural pool of actions featured in a wide range of scenes and viewpoints. By releasing the dataset we hope to encourage further research into this class of action recognition in unconstrained environments.